The best seat in the house is inside the arena, and rodeo’s photographers have been bringing the action to the forefront for nearly as long as the sport has existed. 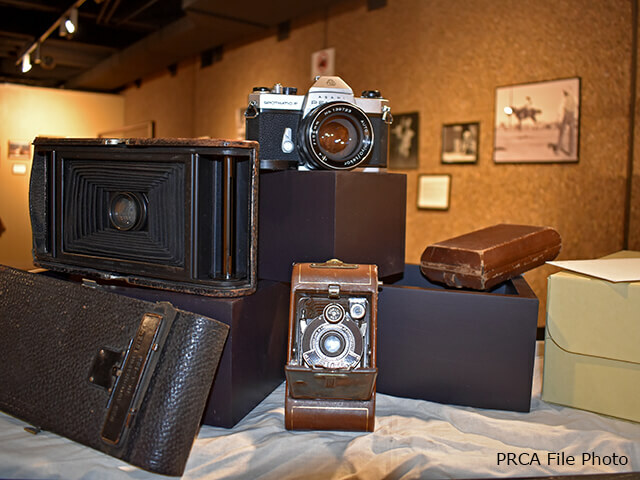 The ProRodeo Hall of Fame and Museum of the American Cowboy’s new display, “Captured Moments: Rodeo Photography Exhibit,” is open through the end of April. The exhibit features a variety, from recent competitions to rodeos more than 100 years ago, with familiar names such as Larry Mahan and Chris LeDoux in the mix. As the sport of rodeo evolved since the 19th century, so has the art of photography. Early photos were of contestants posed for large panoramic photographs before the competitions began. As the equipment improved, action images emerged. Rodeo photographers became more daring by shooting from inside the arena with little or no protection. Some received broken bones for their efforts. Without these dedicated men and women, rodeo’s history would be a lackluster list of locations and participants. Thanks to the action caught through the lens, rodeo’s past and present are immortalized on glass plates, film and digital hard drives. Unfortunately, time has taken its toll on some one-of-a-kind prints, so the HOF is working on a grant project to have the photographs conserved and digitized for future generations. Fourteen of the PRCA’s current photographers have about four photos each on display. The photographers included are Dan Hubbell, Greg Westfall, James Phifer, Richard Levine, Gene Hyder, Jerry Gustafson, James Fain, Brenda Allen, Martin Welter, Terri Abrahamsen, Dudley Barker and Jim Svoboda. DeVere Helfrich’s and Lewis Portnoy’s works are from the PRCA’s historical archives. The HOF is at 101 Pro Rodeo Drive, Colorado Springs, Colo. Winter hours are from 9 a.m. to 5 p.m., Wednesdays through Sundays.